Abs Revealed: The Stone Ages of Ab Training are Over! The Chiseled Age begins with...Abs Revealed! Get the Book. Get the app in iTunes. Chiseled abs, a defined midsection, and a powerful core require more than sit-ups, crunches, and the latest miracle diet. To achieve true six-pack success, you’re going to need a plan. 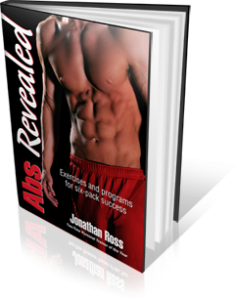 In Abs Revealed, award-winning personal trainer Jonathan Ross provides a complete program for strengthening, sculpting, and maintaining your midsection. There's lots of ab training books out there written by a lot of self-proclaimed experts. This is the only one written by someone that everyone else calls an expert. "Jonathan Ross is on fire and knows what he's talking about. If you're looking for a solution to a commonly frustrating problem-your waistline-you must buy Abs Revealed!" More than a collection of exercises, Abs Revealed shows you how to fire your ab muscles the right way - from the inside out - regardless of your current fitness level, identify your goals, and develop a personalized workout program to fit your schedule with progressions built in for quick and clear results. This results-oriented, step-by-step guide also includes more than 65 core exercises, (many of which were created exclusively for Abs Revealed) ready-to-use workout plans, and advice on integrating abdominal development into cardio and strength routines. Moreover, you’ll discover strategies for applying the latest research on diet and nutrition to enhance and maintain muscle definition and tone throughout the year. "Say so long to ab flab! This whip-smart guide to creating a firmer, flatter middle is packed with practical advice on everything from dietary missteps to essential exercises. Ross cuts right to the heart of why most of us are still grabbing at our guts and wondering what went wrong, then gives us his no-fail approach to getting the results we really want." If you’re tired of doing endless crunches with limited results, let Abs Revealed show you a better way. With proven plans and personalized programming, it’s your step–by-step guide to six-pack success.